Wilbert Robinson was born on Wednesday, June 29, 1864, in Bolton, Massachusetts. Robinson was 21 years old when he broke into the big leagues on April 19, 1886, with the Philadelphia Athletics. 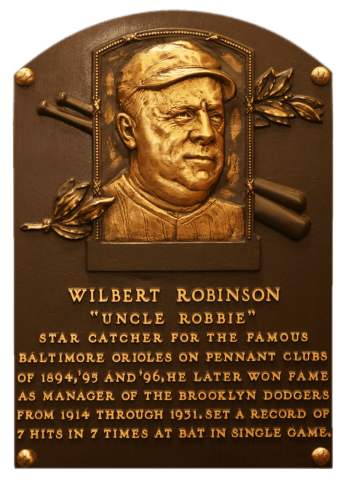 His biographical data, year-by-year hitting stats, fielding stats, pitching stats (where applicable), career totals, uniform numbers, salary data and miscellaneous items-of-interest are presented by Baseball Almanac on this comprehensive Wilbert Robinson baseball stats page. Simply stated: The single best book written about the life, on and off the field, of Wilbert 'Uncle Robbie' Robinson. Wilbert Robinson also drove in eleven runs [ RBI Records ] during that historic game (box score above), another Major League record that appeared unbreakable, until Jim Bottomley had a 12-RBI game on September 16, 1924 ! In 1945, The Baseball Writers' Association of America did not elect any players to the National Baseball Hall of Fame. However, The Old Timers Committee selected Roger Bresnahan , Dan Brouthers , Fred Clarke , Jimmy Collins , Ed Delahanty , Hugh Duffy , Hughie Jennings , King Kelly , Jim O'Rourke , and Wilbert Robinson!